Writing emerged in Mesopotamia, Egypt, and India as far back as 3,000 B.C. Yet writing does not show up in the New World until about 400 to 300 B.C., though there are some isolated finds a couple of hundreds years earlier.The writing of the Mesoamerican peoples consists of logograms and phonetic syllabic signs or glyphs. These signs or glyphs represent syllables and these make up words and logograms represent words or small meaningful units of their language. The common visual feature is many of the glyphs resemble stylized forms of real objects, i.e. people, animals and also geometrical shapes. It was usually written in paired vertical columns reading from left to right and top to bottom in a zigzag pattern. This system of writing is quite interesting as it uses images whereas our alphabet writing system combines letters which in themselves do not have a specific meaning. Their system would have to have many more images than our alphabet has letters which makes it less efficient than ours, in terms of time to write, but can ours convey the same depth of concept as an image conveys? The Olmec writing appears to be the first to develop writing in the New World, whether it was a fully developed writing system as the Zapotec’s is still in question. The Zapotec is still undeciphered and in Mesoamerica is considered the most ancient form of a true and proper writing system. It consists of logograms and phonetic syllabic signs. 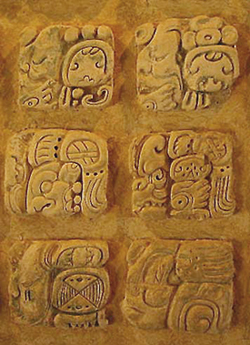 The Mixtec writing is based on the Zapotec. The Aztec glyphs can be read in 3 ways, ideographically, phonetically, and pictographically. Also the color use indicates a different sound. 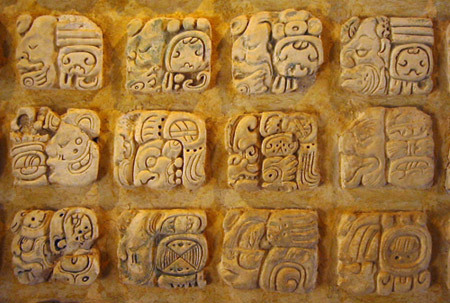 The Mayan consists of logograms, ideograms, and others that are syllabic. In their writing they could express the same word in several different ways. Overall Mayan writing has a higher number of logograms than glyphs of syllabic or phonetic.